Using the Door Of Your Woodfired Oven to Best Effect. Whether you have built your own woodfired oven from scratch or bought one of the many manufactured versions available it probably has a door of some sort. Today I am going to talk about how and when to use the door to best effect and when to ignore it. 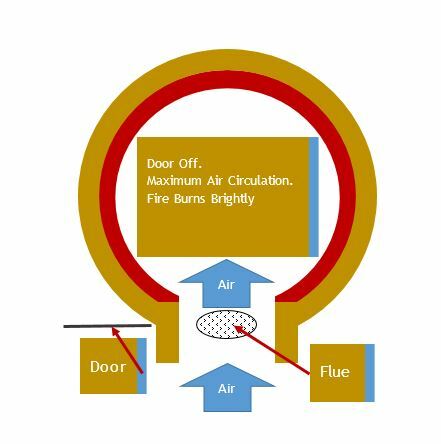 The primary function of the door is to control air circulation. It can be used to do 4 things – stop air circulation, allow air circulation, inhibit air circulation or accelerate air circulation. When you use it to help the oven retain heat you do so by stopping air circulation. 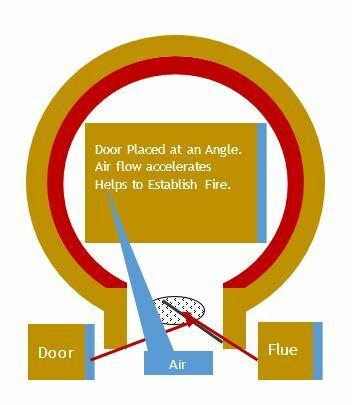 When you use the door to force air through the fire you do so by accelerating air circulation. 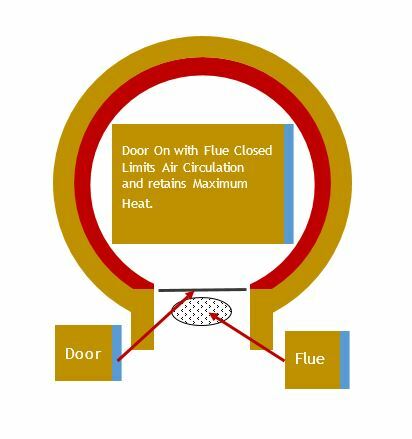 Retaining heat and forcing air through the fire are secondary functions. So it’s all about air circulation and whether we want it or not. In general we want the fire to burn brightly during the heating phase and it will only do this if it gets lots of air. Leave the door off and allow as much air as possible to circulate. Having the door half on does not help the oven heat up and may inhibit it by starving the fire of oxygen. Except (Oh! here we go) when we want to accelerate the airflow through the fire to get it burning quickly. If you place your oven door at an angle in the doorway so that the incoming air has to squeeze through a tightening gap the air will accelerate. (Fig 1.). This Venturi effect forces air into the fire and helps to get it established. However, increased airflow in means increased airflow out so you’ll lose more heat up the flue. Only use this technique to get the fire established or to reinvigorate a fire which has died down. If you’re cooking flatbreads, roasting small joints or vegetables you may do so with a small fire burning in the oven. In this case you may wish to inhibit but not stop the circulation of air to allow the temperature to rise. Place the door so it allows enough air in to the oven to maintain the fire but keeps the flue open to allow fumes to escape. (Fig 3.). We’ve had plenty of people come on classes and say that they’ve cooked a piece of meat which appears to have roasted fine but tastes horrid. This is due to the build up of unvented fumes depositing acrid tasting chemical deposits on the food because they have had the door shut so leave it a little ajar and this won’t happen. If you’re baking, braising or slow cooking with either a dead bed of ash or a cleared out oven then you’ll want stability and maximum heat retention. (Fig. 5) Putting the door on tight will stop almost all air circulation and will give you the most even heat across the oven and will help retain heat for longer. As long as the embers are completely out fumes are not a problem so the flue can be closed. 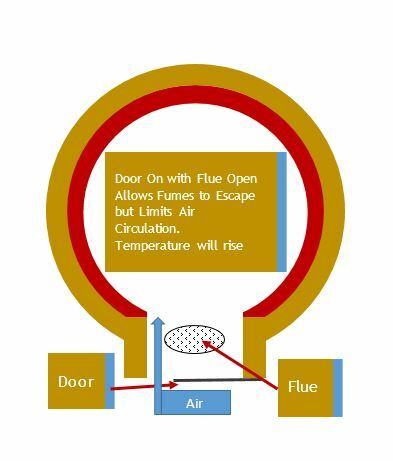 Remember that every time you open the door cool air will rush in and hot air will vent up the flue so try to open the door only when absolutely necessary. As I say during our classes at Manna from Devon, one of the joys of cooking with a woodfired oven is that it’s not an exact science. We have to use our senses, experience and instincts to judge what’s happening as we cook and adjust things as required. If you’ve got the door on or partly on and the food is cooking too quickly take it off or open it a bit more to allow more air to circulate, this will cool the cooking temperature within the oven. If you’re cooking with the door off and your food is taking too long to do what it’s supposed to do then place the door so the air circulation is inhibited. This will cause heat to build inside the oven. No recipe can tell you what’s happening in your oven with your food in your garden. Use your senses, trust your own judgement and enjoy the thrill of being master of your own oven. Not All Doors are Equal. Unfortunately not all ovens have a door as flexible as the ones on the Bushman Ovens we have here at the school. If you have an oven with a fixed, hinged door for example, some of the settings described are not possible. Nevertheless it is still worth thinking about how you position the door to get the correct level of air circulation. To see door positioning in action and to find out lots more about how to cook perfect meals every time in your Wood Fired Oven join us on one of our regular classes.